You know, it’s always the same, I have a big long spell of blogging, and then I don’t do anything for two weeks. Oops. This wasn’t intended, but it seems I did the same last year, after the dizzying heights of the Berlin trip. Oh well. Even for a British summer, the weather has been truly appaling. There hasn’t a day gone by where it’s not absolutely hoyed down at some point, or been so dull that it’s not even worth sticking your foot out of the door, never mind going around and doing stuff. Ever since I’ve came back from Paris, I have had absolutely nothing to look forward to… I tried to change this by arranging a trip to Countdown for me and Chris, but seeing as he has no holidays left, this has fallen through, leaving me once again, staring to the inky void, where the only light at the end of the tunnel is the reflection from the bottom of a beer glass. Even worse, is that it would have been my last chance to see it under its current guise. On a lighter, and much happier note, Wayne has finally got back in touch after 18 months of being silent!! Unfortunately, he missed all of the email I’d sent to him in this time, thanks to NTL/Virgin’s policy of only keeping email on their servers for 90 days, but at least he’s still alive! Coatesy, however, is still radio-silent, and it’s looking less likely that he’ll ever get back in touch. Christ, this is an amusing entry isn’t it? Laugh-a-bloody-minute. To make things worse, morale at Employment Palace has hit an all time low. Once again, I can’t go into details, mainly because I’ll end up putting my fist through the monitor. This has depressed me more than anything, I think. On another note, I’m an organ donor. Or rather, I’ve been for months, but I never bothered mentioning it before. I’m only metioning it now, because I’ve just found an old registration form I meant to send off, but never did. On the back of it, it states “Discuss your wishes with those closest to you, so they know your wishes should the time ever come… I’m sorry, I know whatthey mean, but surely that’s the worst way of putting it, ever? What do they mean by “should”? Do they suddently think I’m immortal, or something? Ahem. On the subject of death, another reason I’ve not been updating much is the “dying” of Beastbits, my main machine… You may remember a few months ago, the 250Gb drive I had, started clicking, going all weird and just not working in general? Well, I replaced it with a 500Gb drive. And that’s on the way out too. It began with The Click of Death. Eventually, strange things started happening The drive would disappear from Windows completely, and today, during the reboot, in the BIOS detection it wouldn’t reappear. Nasty. I decided the drive was duff. My curiousity got the better of me, and after a physical power-off, it reappeared. Now, something was up, and I decided to back everything up to an external HDD. During ther copying process, it halted with a CRC error. Not good. Files were on the bad sectors! Oooooo! I happened to note the name mentally of the corrupt file. Thankfully, it was just an outdated SQL dump I’ve done from my website, and wasn’t of much use anyway. The rest of the backup passed without a hitch. Everything else copied. For a bit of mirth, I decided to copy the original file I’d had a problem with. It copied first time. To me, this began to sound like something more “logical” than physical. Soooo, I powered up “Darik’s Boot And Nuke”. I had used this in the past to “fix” the bad sectors on the earlier faulty drive I mentioned. Anyway. I started it on this drive, and it failed. It quit with an error saying that the drive may have bad sectors. Duh. Fair enough, at least they were official. I wasted at least 3 hours of my finite time on this planet allowing the disk check to finish. It prompted me to perform a disk erase. Meh. All backed up. It can’t do any harm. After all, these sectors were goosed, so another few hours later, the entire hard drive was erased, and I ran another diagnostic check Now, thanks to that photo, I had the exact location the bad blocks. Imagine my surprise as it skipped over them without a single bit of hesitation. OK, so unbelievably, the drive was back to its normal self. All of this took place on Monday night, so I formatted the drive while I was at work on Tuesday. I returned home, and copied all of the stuff from the external backup drive onto it. And, tonight (Friday), it has gone back to the original problem of the click of death. Joy! In a thread on Glens’ forum, I mentioned my problems, and although Crag has a very valid point, it’s still a 100% failure rate. 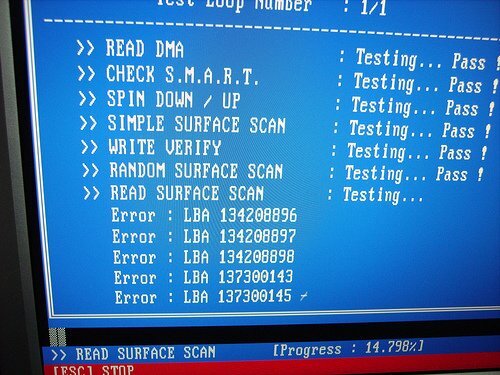 And, I can’t even send it back either, because the only way it will detect bad sectors is obviously after the disk has been in use for a few days after an erase, which means there has to be data on it. And, seeing as I know the sort of ahem… “data” I keep on it, I’d rather not let it out of my sight!